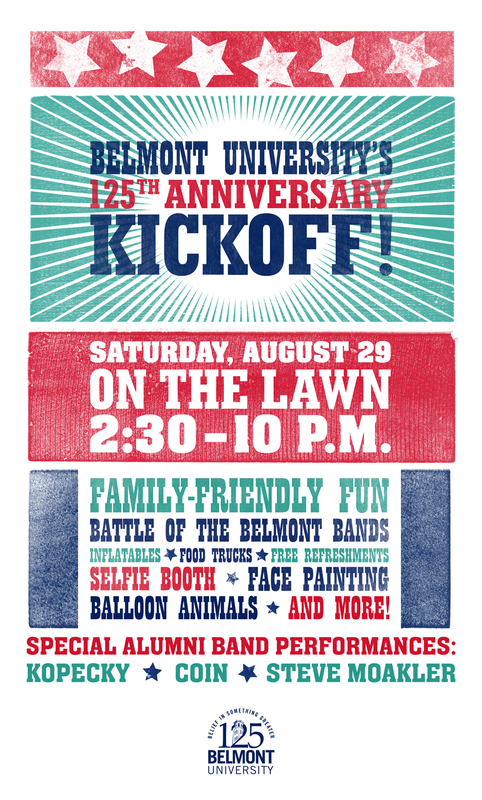 Belmont University will kick off its 125th Anniversary Celebration this Saturday with a family-friendly music festival featuring exclusively student and alumni talent. The event will begin on The Lawn at 2:30 p.m. with the annual “Battle of the Belmont Bands” contest as six selected student bands–Better Eyes, Brave Town, Constellations, Emma Place, Mocha and Nodaway–perform with a panel of industry experts in the audience to determine a winner. Those judges are organized by Musician’s Corner, the annual concert series in Centennial Park to promote emerging artists, which then invites the winner to perform at an upcoming concert. In addition, following the announcement of the “Battle of the Belmont Bands” winner, the evening will conclude with a concert featuring three critically and commercially acclaimed Belmont alumni bands: Steve Moakler, COIN and Kopecky. Throughout the afternoon, children’s activities will be held on the patio in front of McWhorter Hall, including face painting, balloon animals, inflatables, musical performances by “Mr. Steve” and more. Plus, a number of popular community food trucks will be on hand, stationed along the Lawn, to provide refreshments, and numerous stations will be set up around the Lawn to welcome back alumni and friends, provide additional information on the anniversary celebration and sell artist merchandise. This free event is open to the public, and parking is available on the north side of campus in the Inman/McWhorter Garage, the Wedgewood Academic Center Garage and the Baskin Garage, all of which can be viewed on the Campus Map.